Hi! My name is Bo Bo. I am a happy pug with a giant personality! I was very loved by my family but was surrendered when their new baby was allergic to me and my brother, Bowser. They kept us as long as they could, but when things didn’t look like they were going to get any better, they decided it was only fair to us to go to a home where we could be active members of the family again. We have adjusted so well to our foster home and we love the people, children, other pugs and even the cat that lives here! My foster Mom says that I have so much personality packed into my little body that I am busting at the seams! I am NOT your typical pug! First of all, I LOVE to play fetch! I will even bring you a rock out of the landscaping to throw for me and one day I was playing fetch with one of the kids here with a water bottle! I am not particular, I just love to chase after things and bring them back to you. I can also catch a frisbee! I also LOVE to swim! I am a huge fan of being scratched and I am very well behaved. I know a few commands such as sit and down. I am completely house trained and I will race right to my crate with the words, “go to bed”. I prefer to sleep in the big bed with the people and other pugs but I am happy in my crate too. I have a fenced in yard now but I didn’t at my first home and I stick around very well. I like to walk down the road to the mailbox with the other pugs and I stick with the group and close to my people. I am kind of the Mommy pug to the others here although I have never had puppies of my own. I like to groom the other pugs and wash their ears. My foster Mom says I am part cat! She says the same thing about Bowser but I will let him tell you his story! I love Bowser and we have spent the last several years together. Our favorite game is to play tug-a-war with a soft toy and we will do this non-stop for an hour sometimes before we tire of it! I would love to be adopted with Bowser but I would adjust okay on my own too. I think we are the perfect pair, one male, one female/one black, one fawn/ one outgoing and playful, the other playful but a little more laid back. It’s the best of both worlds people! 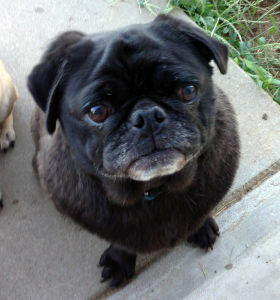 We are very well adjusted pugs and it is very apparent that we have lived with a family that loved us. We have added a lot of love and laughter to our foster home and although they will be very sad to see us go, we are ready to bring our silly little antics to our new furever home(s). Interested in adopting? Bo Bo’s minimum adoption donation is $325.